ALBUQUERQUE, N.M. – Three Albuquerque Police Officers are the proud recipients of a prestigious honor, the Bill Daniels True Blue Award. The Bill Daniels True Blue Award is presented by the Daniels Fund to deserving officers in Colorado, and now New Mexico, who go above and beyond their duties to help their communities. This award is presented to officers by the Daniels Fund in the spirit of its founder, Bill Daniels, who had the utmost respect for people who place their lives on the line in service of others. Daniels grew up in Hobbs, NM and attended the New Mexico Military Institute. He was a decorated naval fighter pilot in World War II and the Korean Conflict. Daniels went on to become a successful cable television entrepreneur known for his compassion for those in need and his unwavering commitment to ethics and integrity. He established the Daniels Fund to give back to the communities that contributed to his success. 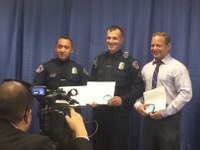 Officers Paul Haugh, Tomas Nadas, and Ladio Canales are recognized for individual acts of compassion that go above and beyond the normal scope of their duties. Officer Paul Haugh used his own funds to purchase bicycles for two children who had theirs stolen. He did so because he didn’t want the children’s summer to be ruined and knew the kids wouldn’t be able to afford replacements. Officer Tomas Nadas bought food for 20 homeless people who would have gone without, due to the power being out at the homeless shelter. He used his own money and said it was his duty as a police officer to help people in need. Officer Ladio Canales bought groceries and necessities for a single mom who he met while she was panhandling in the Northwest Area Command. The woman told Officer Canales she was simply trying to provide for her two small children. Officer Canales personally delivered the items to the overjoyed family and payed for them out of his own pocket.